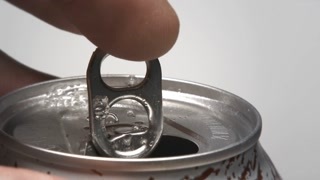 Search Results for "soda pop"
Pouring coke/cola/soda into a glass on a table in a clean, studio environment. Shot in slow motion 60fps on a Sony fs7 in 4k, UHD, Ultra HD resolution. Pouring cola into glass shooting with high speed camera. 1960s: Road sign for Crip's Camp and Coca-Cola. Three men sit on porch. Three cars parked at house. Men sit at picnic table. Man smokes. Man holds plate, beer. Men eating, drinking at picnic tables. Closeup of orange, fizzy, oily like liquid flowing slowly with big and small air bubbles traveling across the shot. A grandfather drinks soda pop with his grandson and reupholsters a chair in the basement of his home in a small town. A grandson drinks soda pop looks at a doormat as a grandfather holds an egg in the living room of his home. A grandson fetches an egg and soda pop bottles from a refrigerator in the kitchen and returns to the basement in the home of his grandfather. A young boy eats candy and drinks soda pop and spoils his supper in 1951. A young boy is ill because he wolfed down candy, a cookie and drank soda pop and, later, he tosses and turns in bed in 1951. In the glass pour soda in the cafe. Close-up. This slow motion video shows a hand taking a straw from a colorful dispenser with a black background. 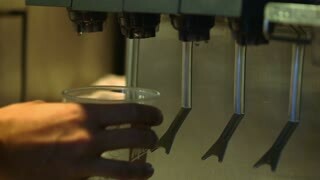 This video shows a hand taking a straw from a colorful dispenser with a black background. 4k Summer party table with pink flamingo theme, ice cream cones, cupcakes and cocktails, panning across. In this Arabic commercial, a nightclub singer entertains patrons drinking Coca-Cola in 1950. 1965 - Coca-Cola bottles are filled and capped by machine. 1965 - Carbonated water, then Coca-Cola syrup, is added to bottles and they are mixed by machine. 1965 - A carbonation tester is used in the quality control lab of a Coca-Cola plant. 1965 - Teens get Coca-Cola to go at a fast-food shop, the beach, and the tennis court. 1965 - A Coca-Cola sorting machine rejects a bottle with foreign content in it. 1965 - Coca-Cola, Sprite, Tab, and Fanta are loaded onto a delivery truck at a Coke warehouse. 1965 - Young people drink Coca-Cola while dancing at a party. 1965 - Coca-Cola bottles are put into cases by machine and transported to a warehouse.